A preview of a work in progress from Zach. it's coming from the inside of the out, the egg laying mother spews all over the face of the pinky-gray infant fetus, as the witch appears and pokes a red hot iron fork into the belly, watching the black liquid drain, the horrible cry against the night air, as it withers, and you die. Awesome. Can I buy it in poster size? I want to frame it and put it in my office. I need a way to fry the skin off newbies (and intimidate interviewees) and I think McCarthy's glare will do the trick. Great idea - I want a poster! What's the context for this quote? It's from EWD1213; its title is "Introducing a course on calculi". Actually, I was asking what's the context for the quote from McCarthy? I absolutely love this! Great picture of John as well. I'd buy this if it was available. Zach, you're onto something here. We need the McCarthy as a single JPG, a la the Dijkstra. I cannot easily make this into a desktop wallpaper otherwise! The Dijkstra one is great! I can easily see this on Cafe Press. 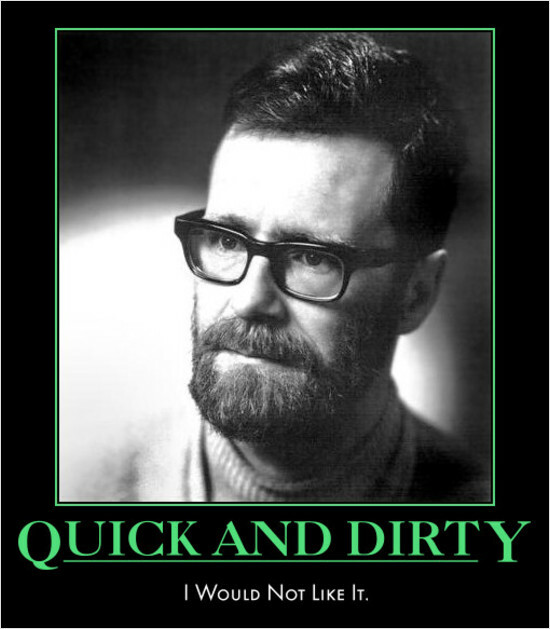 I think the Dijkstra one would be better as: "I do not like it" - I read the pdf and yes the current one is more faithful, but that's when you're /imagining/ him - with his image /present/ you don't need the 'would', and, it's funnier that way. Outstanding, Zach! A little resizing in Photoshop and I've finally got something I'm happy to post in my office. Add a little Knuth, maybe some Hoare, a dash of Turing and you've got a complete iconography of the patron saints of Computer Science. I'd buy a set! 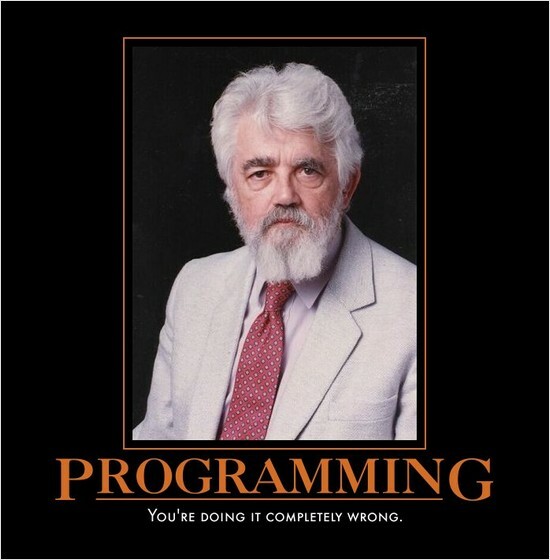 I *LOVE* the Dijkstra poster. I wish there was a high-res version, so I could print it. Pretty please? If it's okay, I did a screencap->png so I could print it out at work, and posted it, as well. Yesterday I had a LONG meeting, which involved making a manager understand that his planned schedule wasn't realistic at all. I could have used a poster in this style, with a picture of Frederick Brooks, a large "SCHEDULES" legend and Brook's phrase "The bearing of a child takes nine months, no matter how many women are assigned.". Great ! Can you, please, provide a McCarthy Jpeg ? http://wigflip.com/automotivator/ is the new online tool for making one of these yourself.